The other day, I took a wander in the style of what some might call ‘cyclogeography’, but which I prefer to think of as merely ‘a bike ride in the hills’. On the edge of the Pentland Hills, which lie just to the south of Edinburgh, there stands a memorial. 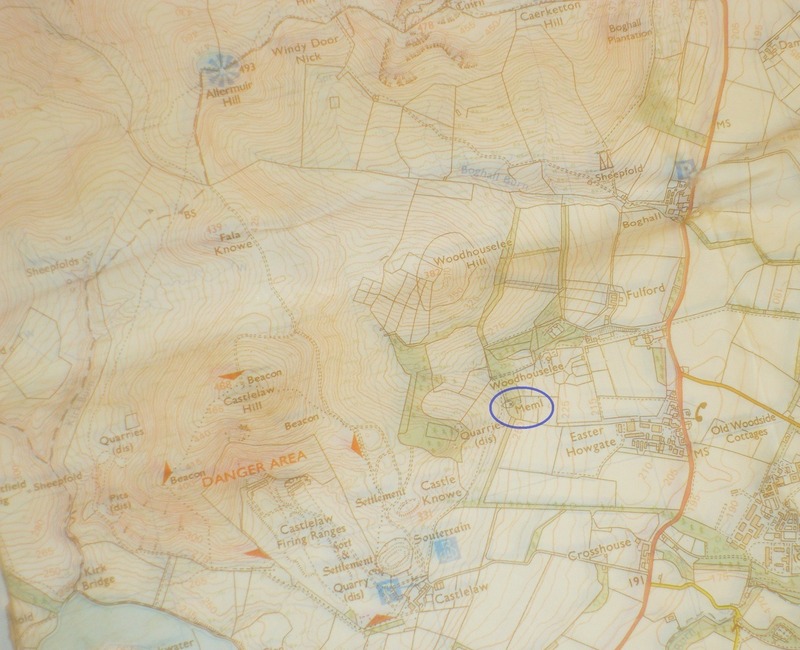 A look at an Ordnance Survey map will show its location, situated to the south east of the masthead that is Allermuir Hill (situated as it is on the city-facing edge of the hills), in the shadow of the imposing Castlelaw Hill, with its DANGER AREA, and red warning flag and the pop-pop-popping of the rifle-range guns, and a stone’s throw from the Woodhouselee clachan (or hamlet). The Ordnance Gazetteer of Scotland in 1882-4 describes Woodhouselee as: “a mansion in Glencorse parish, Edinburghshire, 6 ½ miles S of Edinburgh and 4 N of Penicuik. Romantically seated on the eastern slope of the Pentland Hills”. As far as I am aware, there no longer stands the mansion or tower of Woodhouselee, though I’ve never explored the hamlet to find out. If this is the case, it would be a shame – Will Grant thought it “one of the most delightful in all the countryside” (p66, Grant, 1951). The Titlow family has a long history in the area, being first found in Haddingtonshire, just out in East Lothian. Through time, the name got distorted to Tytler, the family branch of which became seated in Woodhouselee. It is for the Tytler’s that this monument stands. Built in the 19th century, it commemorates various members of the clan, including Alexander Fraser Tytler, who was a professor of history at the University of Edinburgh and Lord of Woodhouselee. It faces down the hillside, looking across an open field, home to some sheep, cows, and some large ornamental trees (is this the remains of an arboretum, attached to the Woodhouselee estate? ), and then over the town of Penicuik, with the Lammermuir Hills making up the horizon. But the contradiction of this – and most – memorials is the direction they face. The photo above shows the front of the memorial, and the short view of the hill behind. In order to see the sweeping views out to the Lammermuirs, we must turn our back on the memorial, or stand behind it. But if a memorial is to stand in a landscape, like the menhirs in Francesco Careri’s Walkscapes (2002), then why doesn’t the face of interest also look away from the landscape? So one may view both landscape and the front of the memorial together? This isn’t the first time I have paused for reflection at this memorial. There aren’t buildings in its immediate vicinity; this isn’t a graveyard – the memorial states that the graves are interred at Greyfriars Kirkyard in Edinburgh. I’ve stopped at this point before. Back then, I leant my bicycle against the rear of the monument, to stand in as a cypher for my own presence, as a means to frame the view behind in order to take a photo. The cross wasn’t significant – I could have leant my bike against a tree or fencepost. But what of the cross itself? But this time, there is something more. Since I last lingered here, a bench has been placed on slope behind the cross. 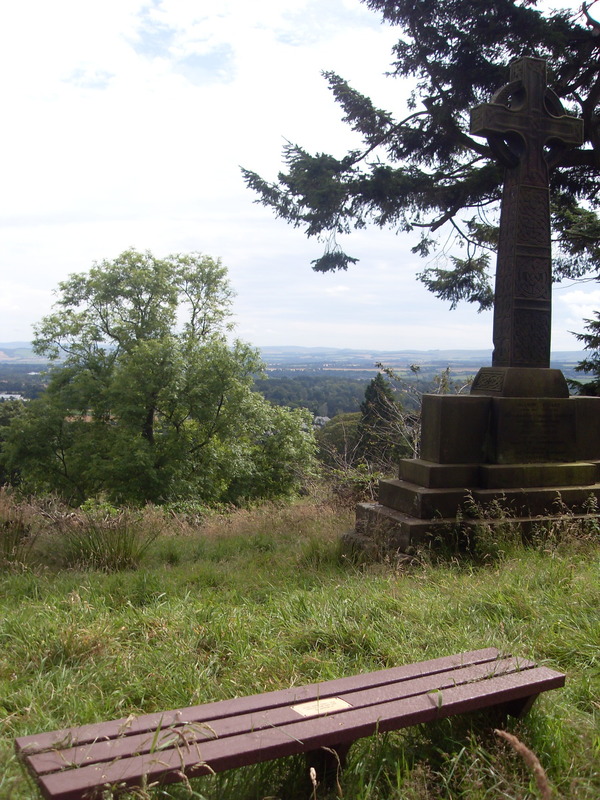 Sitting on the bench, one is drawn to the vast view, with the cross at the neartohand. The plaque on the seat states “In memory of Mae and Will Hoggan who so loved these hills.” So this is a more modern take on the memorilaisation. But to what hills does this plaque refer? The horizon is filled with the Lammermuir Hills, but this bench lies unquestionably in the Pentlands. Just which hills did they love? In 2009, John Wylie considered the memorial benches overlooking a Cornish cove. He conceives of the landscape as being criss-crossed by multiple gazes – gazes of those who are absent, where the benches become those who are absent, and the person sitting on the bench manifests the gaze of the spectre: “looking-with – a host of ghosts and memories” (Wylie, 2009, p277). It’s a curious notion. As I sit on the bench, I manifest the gaze of the missing couple (whether they like it or not). The bench-and-me becomes the absent. And so too for the cross. 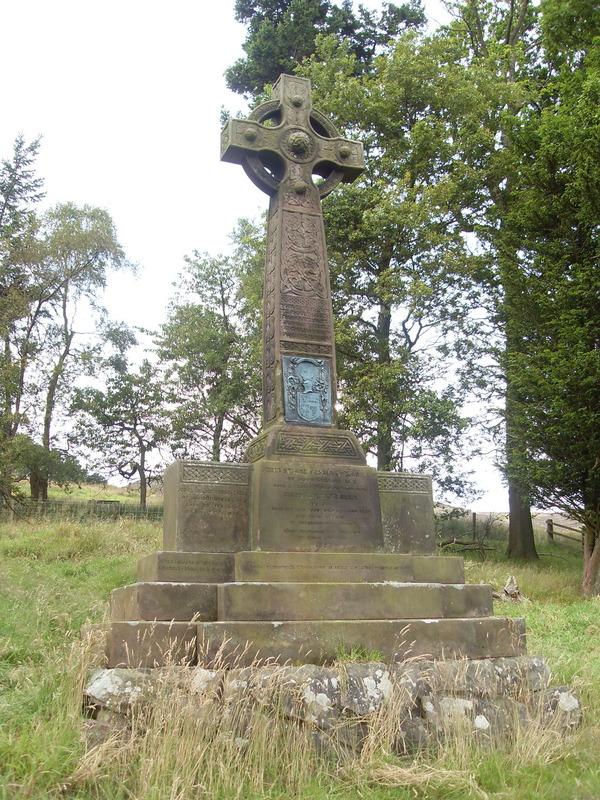 The reason the cross faces across to the Lammermuirs is precisely NOT to frustrate those who come to remember those passed. It is because, in the process of creating a memorial, it becomes the very thing it is there to remember. The physical remains of the Tytlers may not lie here, but there forever remains their eternal gaze, facilitated by the cross. The family motto becomes a suitable epitaph: Occultus non extinctus: hidden not extinguished. The hills so loved by Hoggans become apparent. It is the Pentland Hills, but not just for the hills in themselves, but for the views across the landscape that these hills afford. For while the Pentland Hills may have a neat line drawn around them when viewed on the map, a categorisation that assists both users and unitary authority in their making their way around, it is these views across lines-of-concept that give the hills their life – even in death. This entry was posted in Landscape, Memorial, Pentlands, Uncategorized. Fascinating ideas of presence and absence and the links between. I always read the inscriptions on memorial benches! Those references sound worth reading too. Like that idea of landscape being criss-crossed by multiple gazes – even absent ones. Great. This +1. Have always thought similiar. Especially with more ancient examples (standing stones etc). Remember my first time at Stonehenge and standing with my back to it looking out at a string of Barrows that most people ignore. The people I was with were very confused.